With enhancements in technology taking place at lightning speed, we, humans crave for a more technologically advanced and comfort living. Building automation is one such endeavor in this direction, essentially referring to a Building Management System (BMS) or Building Automation System (BAS) that includes systems such as lift, alarm, fire detection, parking sensors, air conditioning, etc. These systems are connected to the internet and can be monitored from remote places. Also, multiple buildings can be monitored by a central base station through the internet. Building Automation Systems lead to energy conservation, improved and comfortable living and reduced operating costs. 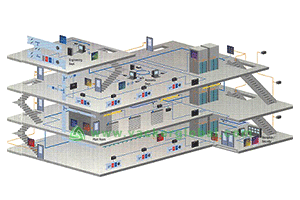 Vacker KSA is doing building automation in places like Dammam, Riyadh, Al Khobar, Jeddah, etc. Motion Sensors and Presence Sensors for sensing motion and presence of people respectively. Other parameters can be monitored by using various sensors. Within a BMS, a communication language or protocol is used for transmission of signals between the system components and a central processor. A BMS will usually have a large number of components interconnected to each other, communicating through the protocol. Manufacturers of components have their own protocols, with some prominent ones being BACnet, Modbus, KNX, Lonworks, etc. Further amendments, if any, to the system, require usage of components adhering to the same protocol. However, one can use an interface component to integrate with components using different protocols. KNX is an example of one such open interface protocol component. Automated home theatres in which the video being played will be paused or volume will be reduced automatically based on any external hindrance like a phone ring. Depending on the sun rays’ intensity, curtains will be automatically drawn in order to reduce direct penetration of the rays. Switching on/off the air conditioning system can be done through voice commands. Sending SMS or using mobile apps to switch on/off the air conditioning system, lights, heater of the room or building. Lighting of the house based on the time of the day or sunlight intensity.